It’s October, and many plants here in the Eugene, Oregon area are going dormant for the winter. This is the time of year that we really begin to appreciate our evergreen plants. While they bring life to our gardens throughout the seasons, the prominence and character of evergreens in a planting design can shift throughout the year. Evergreens often play a supporting role to the exuberance of summer blooms, providing a subtle backdrop that recedes until other plants begin to go dormant. We rely upon their winter foliage to provide privacy, interest and contrast. Creating a harmonious planting plan that balances evergreens with deciduous and flowering plants is critical to providing year-round appeal and creating interesting outdoor spaces. When picturing an evergreen many people imagine a coniferous tree, such as the iconic Douglas Fir that grows throughout the Pacific Northwest. However, the term evergreen encompasses a diverse range of broad-leafed and coniferous trees and shrubs – including many native species - that retain their foliage over the winter. While dark green foliage is common in evergreens, you can add a wide array of color to your garden with evergreen trees and shrubs. Abelia, Leucothoe, Oregon Grape, and Nandina all provide a myriad of hues, from yellows and greens to reds and purples. Plants such as Cotoneasters and Holly have bright berries that add punctuation to their evergreen foliage. Evergreens can also bring many different textures to your garden. Some leaves, such as those of Japanese Fatsia, are large and tropical, while others provide much filmier and small texture, such as Bamboo. Because they persist throughout the year, evergreens play a vital role in creating the character of your landscape architecture. There are few times that we appreciate evergreens more than in the wintertime. Many plants remain dormant in the winter, leaving browned foliage and bare twigs that seem desolate. Evergreen plants help maintain appeal during the winter months, bringing much-needed color and life to our landscapes. These plants are deeply entwined in our wintertime traditions – many cultures bring in cut boughs during the winter month to symbolize life and health. The smell of pine and fir needles evokes a sense of comfort on a cold winter day. In the winter garden, evergreens also provide us with privacy and shelter. Hedges are often created with evergreen plants, which offer screening throughout the year. Traditional gardens use Boxwood or Privet for hedges, but many evergreens will tolerate pruning and hedging with grace, and may provide a more casual aesthetic. Choosing to use a hedge for privacy does not need to limit or define the aesthetic style of your garden. Additionally, whether in straight lines or clusters, evergreens buffer wind speeds in a garden, creating calmer microclimates on blustery winter days. While winter and fall may be the time that evergreen plants shine, they play a vital role throughout the year. The evergreen elements provide continuity throughout the seasons; therefore, they are especially useful in structuring your garden. Using evergreen plants around the edges of your garden will help ensure that it remains well-defined even as the more ephemeral plants lie dormant. Those same edges will act as a backdrop, providing a calm foil for the more showy flowering plants that emerge in spring and summer. As the season progresses, the deep greens of evergreen foliage set off the vibrant hues of fall foliage. 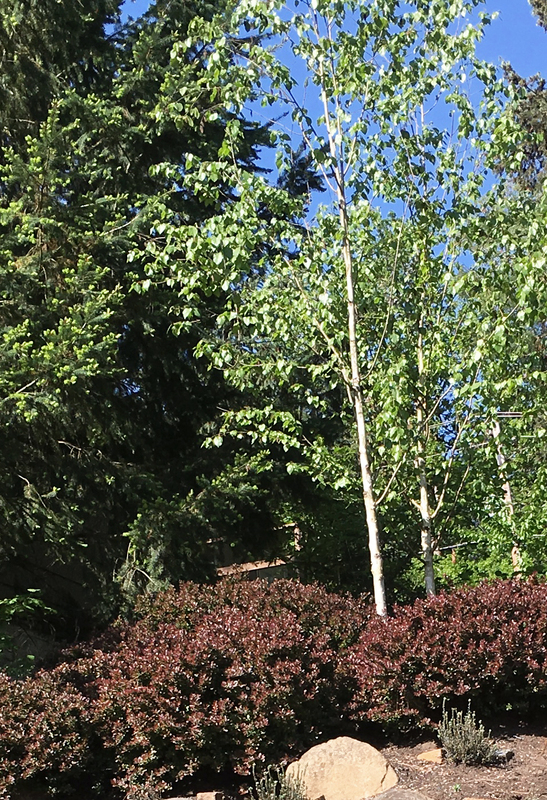 Light colored bark – such as Birch tree bark – takes center stage when set against a dark evergreen background. Similarly, the bright stems of Red Twig Dogwoods sparkle against the darker foliage. Though the role of evergreens in your landscape architecture may evolve through the seasons, their presence provides critical structure and continuity to your garden. Most gardens benefit from the addition of seasonal interest and vibrancy that perennials and flowering plants bring, but they benefit equally from the stability and continuity of evergreens. Successful gardens harness a carefully considered palette of evergreen and deciduous plants to provide interest across the seasons. Achieving a proper balance in planting is one of the most challenging and rewarding aspects of creating an inviting landscape, and is something that we love to work with at Lovinger Robertson Landscape Architects. As we enter the fall and wintertime season, it is a great time to think about structure in your garden and how evergreens will liven up your space. In every domestic landscape, there are moments of entry – thresholds that separate the personal realm from the public. Whether these thresholds are explicit or more subtle, they shape the experience and rhythm of outdoor space. In landscape design, thresholds create unique opportunities to register a moment in time. They guide us through the landscape and concentrate a transition between two realms. Thoughtful thresholds will make meaningful connections between spaces and enrich the garden experience. Good spatial definition creates intentional outdoor rooms. The transitions that link these rooms help set the tone for the space. While arches and gates form literal entrances, plants are a great tool for implying edges and transitions. In the temperate climate of Eugene, Oregon, many different plant species thrive. This produces a rich palette from which gardeners can choose specimens that define the character of a space. To create a formal entrance, the vertical structures of conifers will act as gateposts to the garden. Trees with branches that join overhead create gateways. Small multi-trunked trees such as vine maples or witch hazels framing a path provide a more whimsical introduction. While trees and other vertical elements are useful markers, the ground plane creates another opportunity to articulate transitions. A change in materials underfoot can slow movement or mark a change in space. The crunch of a gravel walkway contrasts with a smooth paved surface, articulating a change in space. Thresholds are more than a simple link between two spaces. They choreograph the experience of moving through the garden. They help create separation between the public and private realm, providing a heightened sense of arrival to the domestic sphere. A well-designed threshold extends the boundaries of the home into the garden. These transitions help you shed the static of everyday life as you leave the car behind and enter the sanctuary of the home. Positioning thresholds carefully will frame views and draw you through space. Highlighting a beautiful destination with a constricted opening creates intrigue and an invitation through the garden. Thresholds create contrasts - between open and enclosed spaces, between light and dark, public and private – and compress that contrast into a single moment. This compression heightens awareness and defines space. Thresholds are an important ingredient in creating comfortable outdoor spaces, and are carefully crafted at Lovinger Robertson Landscape Architects.